It goes without saying that the key to successful warehouse operations is smooth, efficient product flow. But when you’re relying on employees to package your product, you leave yourself open to inefficiencies in your process, human error and mistake, inconsistent quality, ever-increasing labor costs and other operational difficulties that can easily be solved by moving to an automated system. Packaging equipment and automation can work long hours while maintaining a consistently high quality and increasing your output. Let’s take a look at 5 pieces of equipment and automation that could help improve your production. Case erectors can work 9 times faster than manual packaging processes. If you’re using 500 cases a day, then case erectors will produce an ROI in less than 12 months. They’re highly customizable too, they can fit any production line and handle any product size. One of these machines will replace multiple working tables on your floor. Increasing labor costs are a major factor in the decision to use equipment. Thankfully, most case erectors can be fully operated with 1 to 2 people. Stretch wrappers can reduce film cost by 75% compared to a manual hand film process. If you’re hand wrapping 20 or more loads per day, it’s more cost effective to use stretch wrappers than to wrap by hand. At that level, automated packaging equipment justifies its cost by reducing manual labor expenses and the possibility of injuries. Damaged products equal lost revenues because damaged products either need repair or replacement. By using stretch wrappers, creating stable loads and wrapping them properly, it’s possible to recover up to as much as 50% of your potential lost products. By automating the case sealing portion of packaging, you have the potential of increasing your output by 600%. If you’re currently manual sealing at least 250 boxes a day, case sealers will achieve a positive ROI within months. Sealing rates with case sealing machines are up to 6 times faster than manual sealing rates.That means less production time and higher production output on a daily basis. Are you starting to see a trend here? Packaging equipment cuts your labors costs, production time while improving your production and bottom line. It’s really a win win. When you use staples, glue, or straps to seal boxes, there’s a higher probability of damage to your products. Eliminating most product damage is one of the key benefits to packaging equipment. With case sealers, you also eliminate the likelihood of fatigue, downtown, and strain injuries on your employees. Batching and bagging systems can reduce labor by up to 80%. These bagging machines and accessories use technology to improve productivity while reducing labor overhead, preventing shipping damages, insuring proper weigh distributions, and managing risk with quality outcomes. What’s the usage level to justify auto bagging machines? 10,000 bags a month. With that kind of packaging production, you’ll easy see a return on your investment in just a few months. Most automated packaging equipment shows a positive ROI in less than 12 months, and bagging machines are no different. Strapping machines are designed to match your entire production process and reduce bottlenecks, while keeping your employees safe. There’s a variety of strapping equipment available; semi-automatic, arch, and full automatic. Each of these style of machines help lower the amount of manual labor needed while decreasing those ever-increasing labor costs. Match the production rate of the rest of your packaging process by integrating these machines. They can merge with an assembly line or conveyor system for a more automate operation. Some machines, like the one shown to the left, offer interchangeable components that simplify maintenance and minimize service disruptions. Of course if you do have machine problems and need your packaging equipment serviced, IPS packaging has a complete service, tools, and repair program. Ready to talk about your packaging pain points? We can guide you through the packaging equipment and automation process and see what’s the right situation for you. No two operations are exactly the same, you’re going to want a customizable plan that fits your needs. Learning about equipment is even easier when it’s on your schedule right? 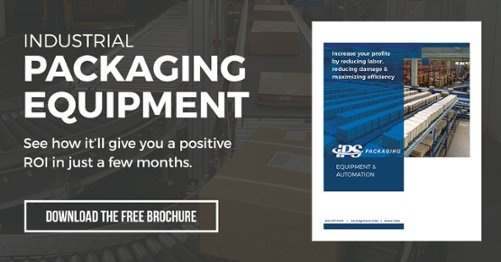 First: Download the packaging equipment and automation brochure. Next: When you’re ready to talk, just click the link below and you’ll be on your way. Schedule a time to talk with us that’s best suitable for you, we’ll be ready. *Editors note. This post was originally published on April 16, 2018 and has been updated with the most up to date content.